I just love it when 6:00 rolls around and no one has even started to think about dinner. This is why I wish we made a weekly menu at the start of each week. So I run upstairs and grab my Cooking Light magazines and start thumbing through them. I get about 2 pages into the March issue when one of my starred recipes pops up -- in the "superfast" section. Awesome. It only takes 20 minutes to make. Even better. However, I have to run to the store first to get some of the ingredients. Frustrating. But I ran to the store anyway (do they really not sell dry-roasted peanuts in anything smaller than a huge jar?). This recipe really did take only about 20 minutes to make, unlike many other recipes that say "20 minutes", but really take 30-40 if you haven't made it before. Overall it was an okay recipe. 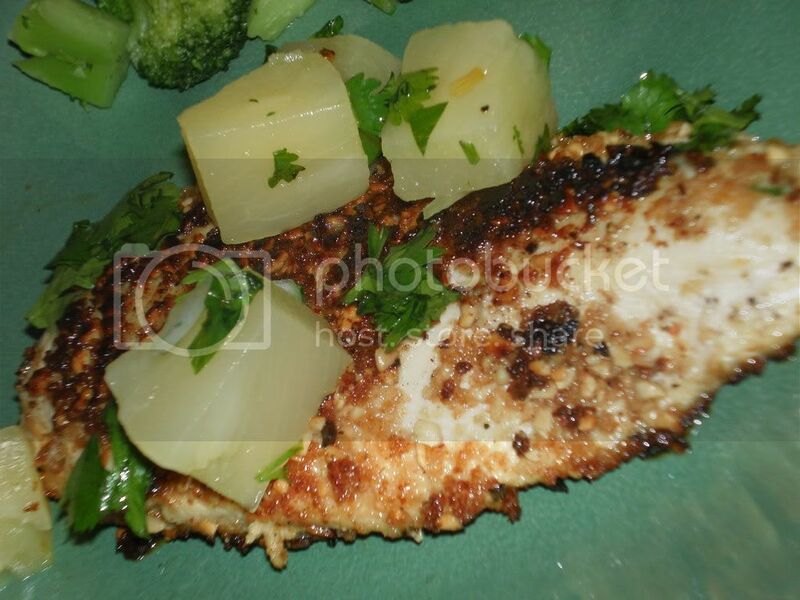 My chicken turned out a little darker than the picture, which really had me worried at first. I cheated a bit and used canned pineapple chunks rather than chopped fresh pineapple, but I really didn't feel like going through all that work. Next time though, I would definitely either chop the pineapple up smaller, or double the recipe and throw it in a food processor first. The chicken took a lot longer than 2 minutes to cook, as well, but that really wasn't a big deal -- I kind of expected it. Taste-wise, the chicken on it's own was rather bland, but the part with salsa on it was rather interesting. I've never really had a fruity salsa before and this one worked pretty well (as far as I know). I would probably make this again, with a few alterations. Combine first 3 ingredients in a small dowl, tossing well. Combine peanuts and bread slice in a food processor; process until finely chopped. Sprinkle salt and pepper evenly over chicken. Dredge chicken in the breadcrumb mixture. Heat oil in a large nonstick skillet over medium-high heat. Coat pan with cooking-spray. Add chicken to pan; cook 2 minutes on each side or until done. 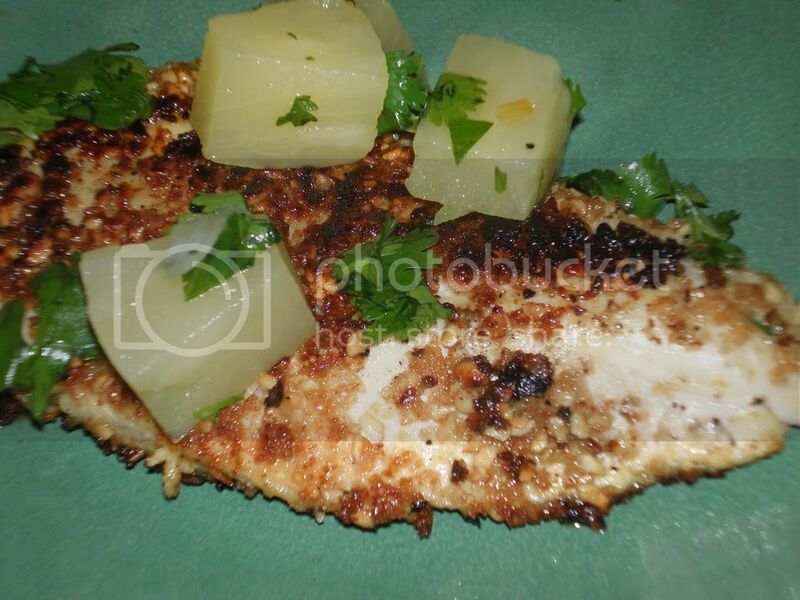 Serve chicken with pineapple mixture. Garnish with cilantro sprigs, if desired.